Bitcoin Core is both a daemon also a Wallet client. A fully functioning node must have the Bitcoin Core (formerly Bitcoin-Qt) daemon running on a machine instance with the complete block chain downloaded. Note that this speed-up is no longer be needed for Bitcoin Core version 0.10 (click here for Bitcoin Core version history) and above because blockchain syncing is paralleled across multiple peers and and is much faster than the version of 0.9.3 and before. Once you're there, click on "Mac OS X". Go to Applications folder, double click on Bitcoin-Qt. 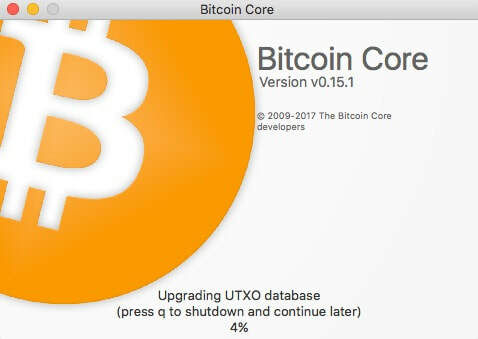 If you're upgrading from a previous version, you'll see it upgrading UTXO database, then you'll see it starts verifying blocks and the wallet will be ready within an hour as it continue to synchronize with network. At this point, the catchup work left to be done should be days worth of cpu-intensive work. 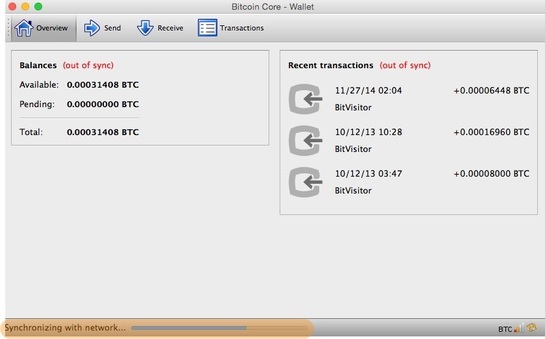 Now that you have a Bitcoin wallet installed on your computer, you can buy Bitcoin and have the seller send BTC to your wallet.